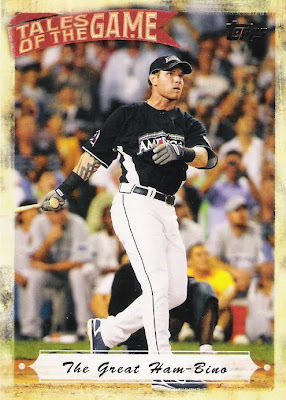 One of my 2010 Card Collecting Goals was to collect cards featuring players holding more than one bat. I have always wanted to collect cards of a certain theme (i.e. play at the plate, pitchers batting, etc.). 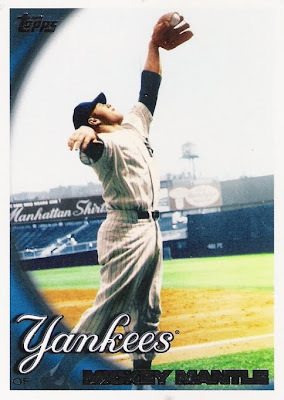 I finally decieded what my theme would be and set a goal to have 50 of these "theme" cards by the end of 2010. Here is my list. I currently have 76 out of the 50 cards for my goal. 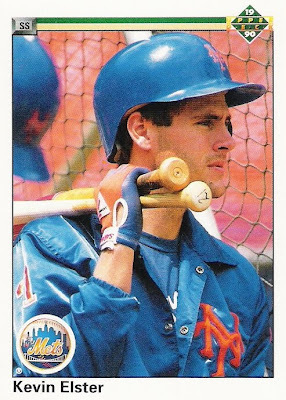 If you have any cards of players holding more than one bat, that is not on my list please let me know so that we can work out a trade. Thanks! The other 4 cards of an eBay purchase. 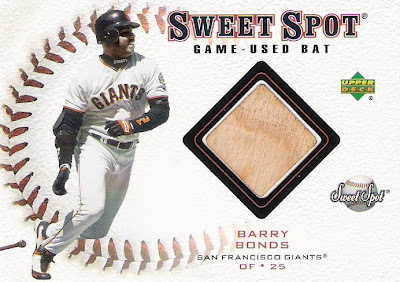 I recently posted about a 2001 UD Sweet Spot Barry Bonds bat card that I got as part of a 5 card lot on eBay. I bought the lot because I needed the Bonds Bat card for my 500 Home Run Club Bat Collection. Here are the other 4 cards from that lot. 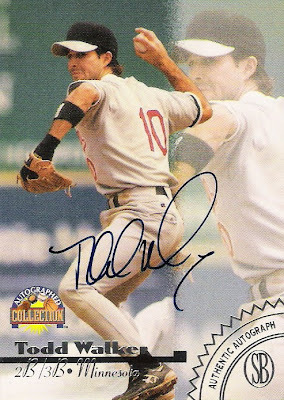 1996 Score Board TODD WALKER Autograph - Todd played 12 season in the Majors and ended his career with a .289 batting average and 107 home runs. 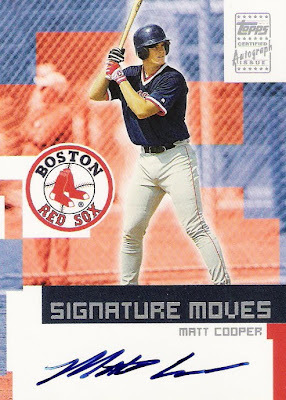 2002 Topps Traded Signature Moves MATT COOPER Autograph - Matt never made it to the big leagues and was out of baseball all together after the 2003 season. 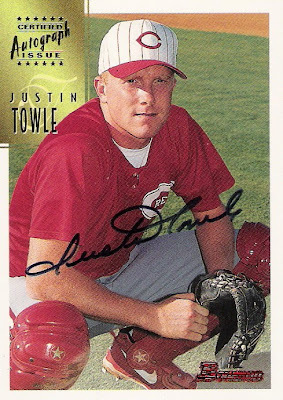 1997 Bowman JUSTIN TOWLE Autograph - Justin never made it to the big leagues. 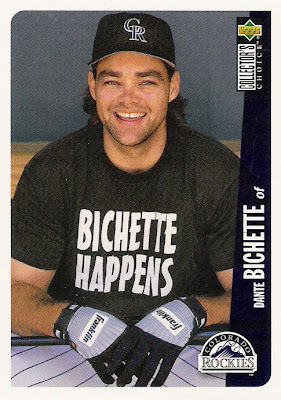 An injury ended his baseball career and he never played after 1998. 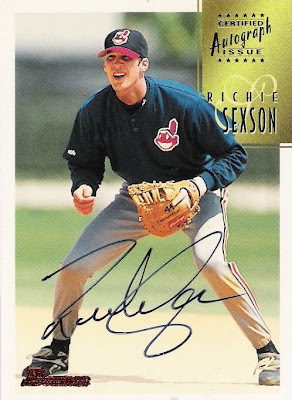 1997 Bowman RICHIE SEXSON Autograph - Richie is a 2 time all-star (2002 & 2003) who played 12 years in the big leagues. 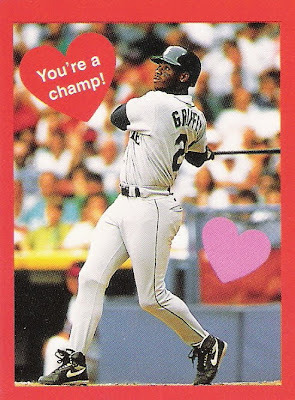 He hit 306 career home runs and made over $60 million! 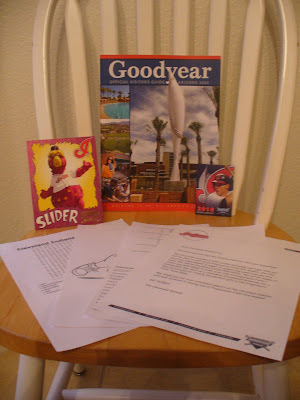 Last week I emailed several teams and requested a Fan Pack. 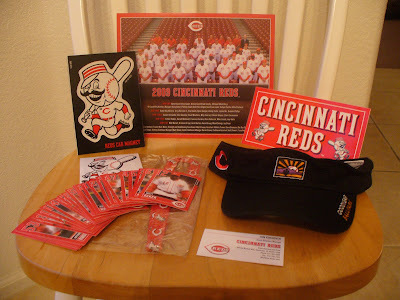 I started with the Cleveland Indians and the Cincinnati Reds because I live about 2 minutes from their Spring Training Stadium and plan on seeing several games this year. I recieved Fan Packs from both teams on the same day. 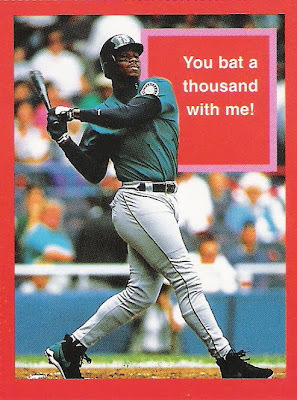 I added a 2001 UD Sweet Spot Barry Bonds bat card to my 500 Home Run Bat Collection. 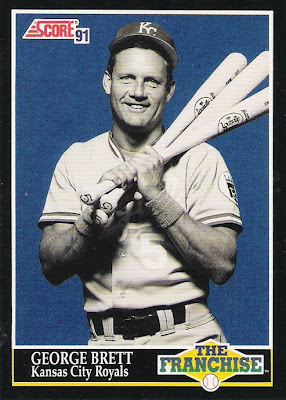 I now have a bat card of 12 of the 24 members of the 500 Home Run Club. I'm half way there! 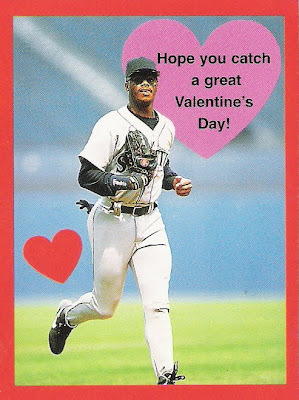 This one came via eBay. I got it as part of 5 card lot. 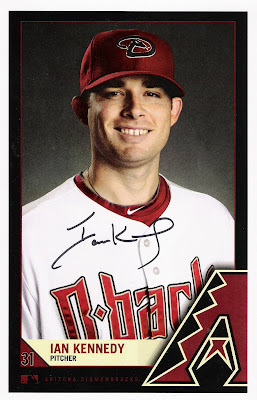 The lot included 4 on card autographs and this bat card. I got the lot for $9.99 plus $2 shipping. 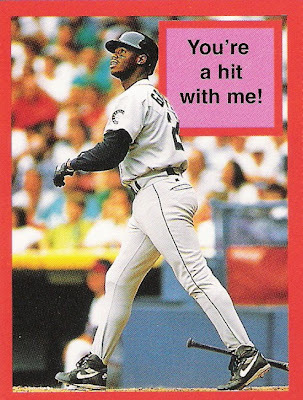 I'm trying to get as many 500 Home Run bat cards from 2001 Sweet Spot as I can, (I already have Thomas, Sheffield, Sosa & Jackson from 2001 Sweet Spot) so I wanted to get Bonds from the same set. I will do a seperate post on the 4 autos that I got as part of the lot. 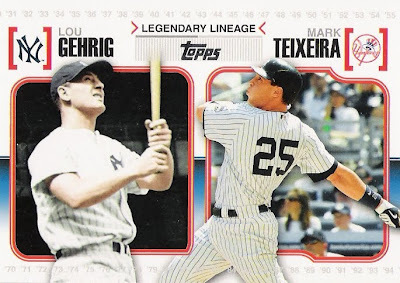 If you have any bat cards of any of the 500 Home Run Club members that I still need, and you are willing to trade, let me know so we can work something out. Thanks! 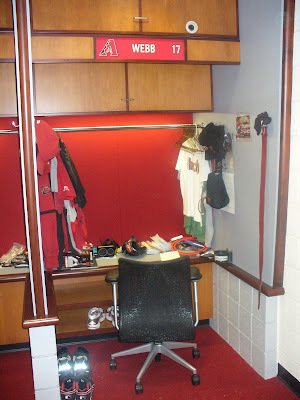 I'm a huge D-Backs fan and I had never been to a D-Backs Fan Fest before yesterday. It was awesome! I planned on attending with a buddy of mine, but we weren't able to meet up, so I went by myself. 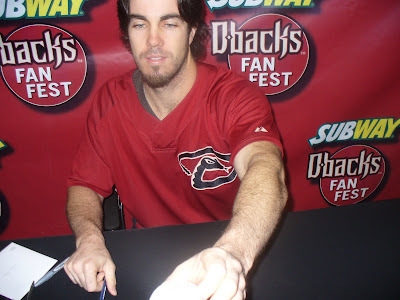 Subway was the main sponser and they had a promotion going where if you bought two value meals, you could bring in your reciept and get in an hour early and get Dan Haren's autograph for free. So I took advantage of that opportunitty and arrived right at 9 am. 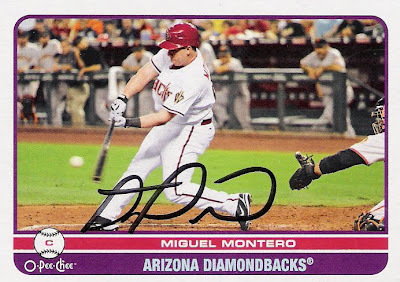 When I got in I was surprized to see that people could pick between Dan Haren, Luis Gonzalez, and Miguel Montero for their free autograph. I wanted Haren, so I got my voucher and got in line. I probably waited about 45 minutes or so, not too long. Here is a picture of Dan handing me my ball back. Not the best picture, but a picture nontheless. 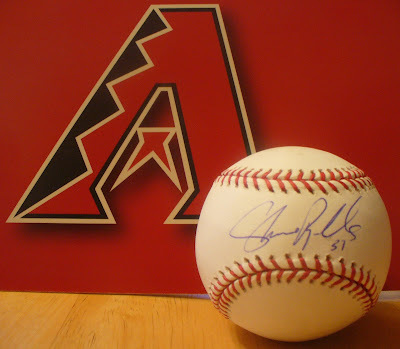 Here is my new Dan Haren autographed baseball. From there I walked over to section 132, where I could enter the field. Here is a shot of the field. 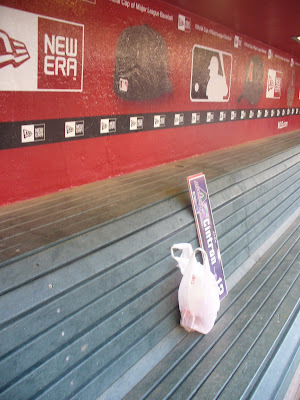 I headed over to the Foundation Yard Sale. 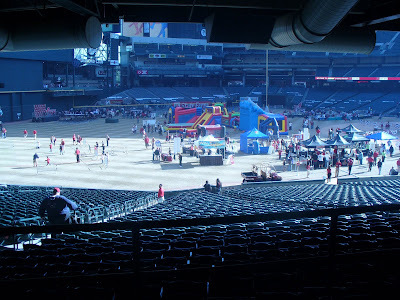 Again, this was my first D-Backs Fan Fest, so I was unaware of the Yard Sale. 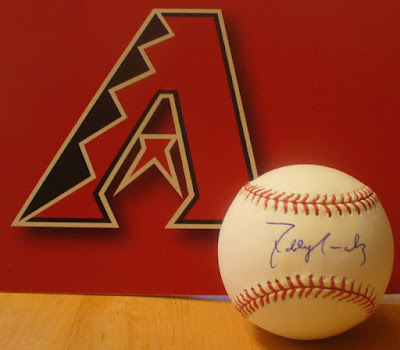 I walk in and right off the bat are a couple thousand autographed baseballs for sale, mostly from former D-Backs. They wanted $50 for Gonzo and then had several players for $25, $10 and $2. 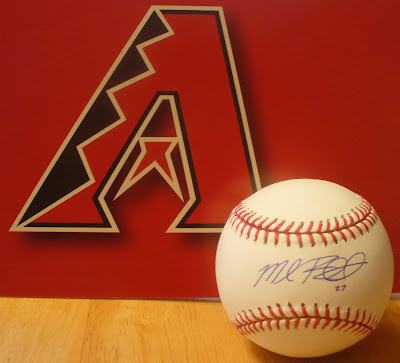 That's right, $2 for an autographed MLB ball. I could have gone nuts, but I controlled myself and picked out two balls that were each $2. 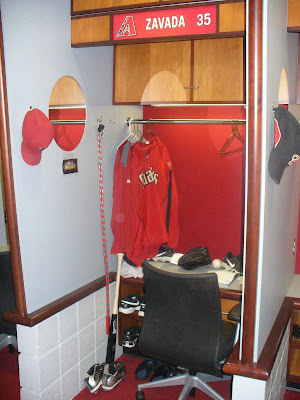 They had broken bats, game worn hats and jerseys and a smattering of other items all for great prices. 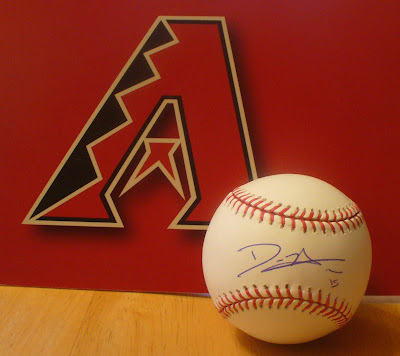 All proceeds went to Diamondback charities. Here is what I got. 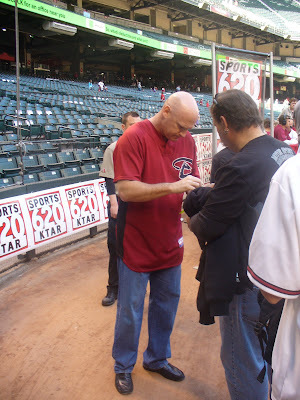 After checking out at the Yard Sale I started wandering and ran into Matt Williams, who was signing autographs while waiting for his turn to go on the radio. 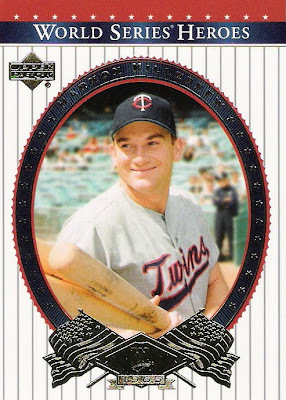 I pulled out my card binder, but for some reason I had forgot to bring any Williams cards. 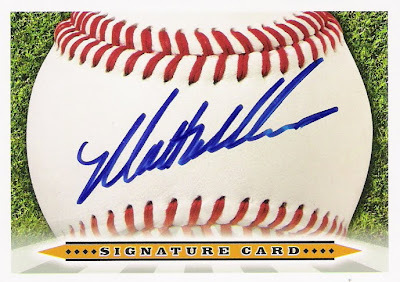 I did however, have some Signature Cards, so I had Matt sign one for me. Thanks Matt! 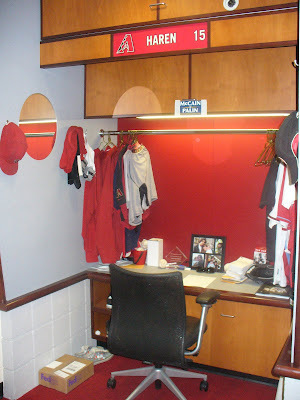 Next I went over and took a tour of the locker room/clubhouse area. 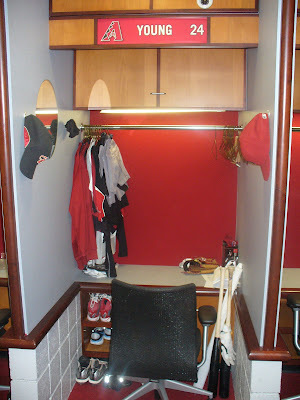 Here are some of the teams lockers. 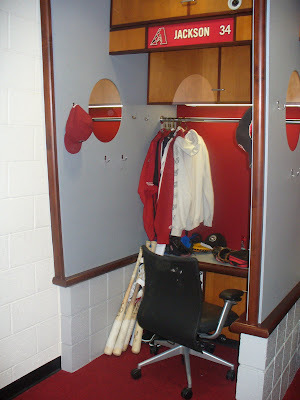 The tour ended with you coming out in the dugout, which was pretty cool. I had a great time! 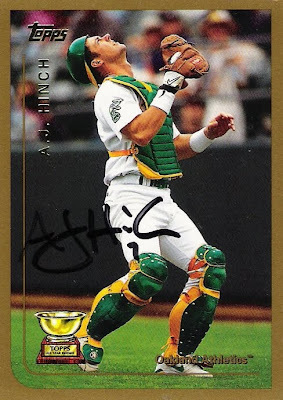 My time and funds were both low, so I didn't stay for any of the autograph sessions that required a $5 per player per item donation, but I still ended up with some sweet auto's to add to my collection. I can't wait til next year! 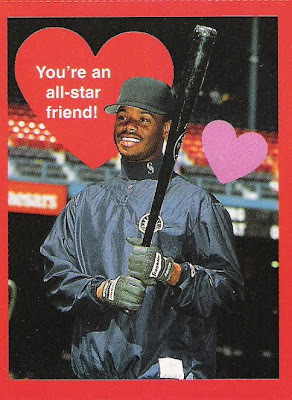 Ken Griffey Jr. wanted to wish everyone a Happy Valentine's Day! 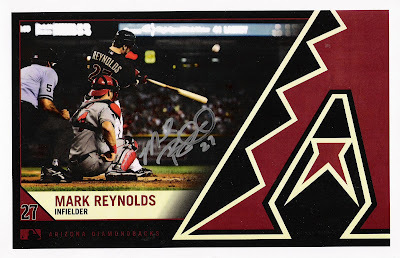 Well, I finally got a good picture of the Mark Reynolds autographed baseball. While waiting in line someone mentioned that they weren't sure if Mark would sign the sweet spot because these were free autographs. 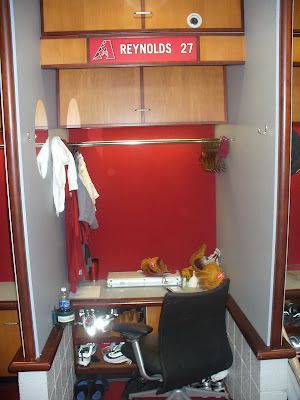 When I got closer, I saw a guy hand Mark a ball and Mark signed it on one of the side panels. So when I got up there I asked if he would sign the sweet spot and he said he would. Then he started looking around for a pen - all he had was Sharpies. The guy in line behind me gave a pen to Mark and said he could use it, but it was a black pen, so I said, "Is that blue?" Mark looked at it and said "No, it's black." 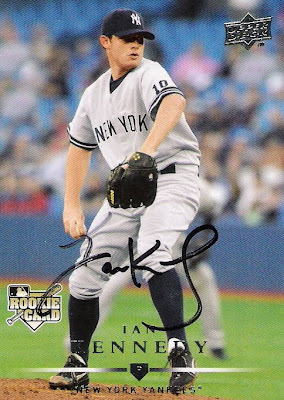 Then A.J. Hinch leaned over and handed Mark a blue pen and he signed my ball. So, it wasn't without a little drama, but I ended up with a Mark Renolds autograph on the sweet spot in blue ballpoint pen. Thanks Mark! 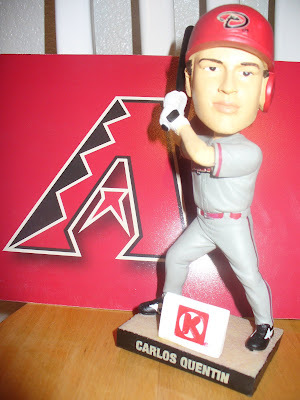 I listen to KTAR Sports 620 on the way to and from work everyday. 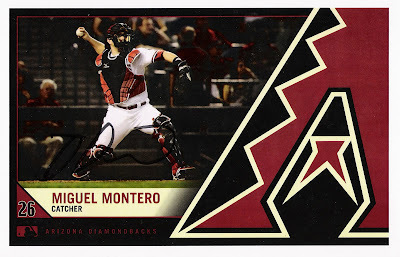 Earlier this week they mentioned that several D-Backs would be at the Wild Horse Pass Casino on Friday, February 12th, signing autographs from 6 pm - 7pm. The lineup included Manager A.J. Hinch, catcher Miguel Montero, newly aquired pitcher Ian Kennedy, and star third baseman Mark Reynolds. I spent about an hour in traffic, but arrived at the casino a little after 5 pm. I was probably about the 15th person in line. 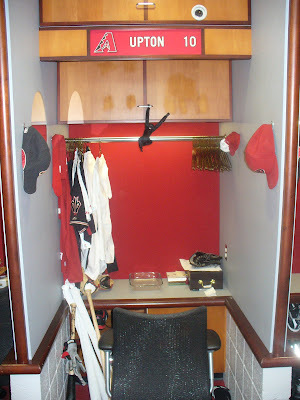 Every person could get 1 item per player signed. 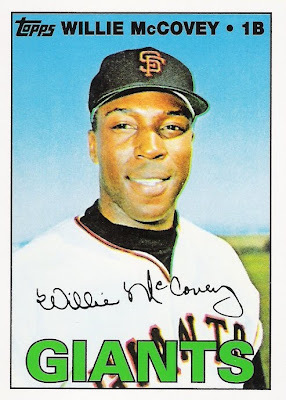 If you didn't have an item, then they had 5x7 cards of each player. 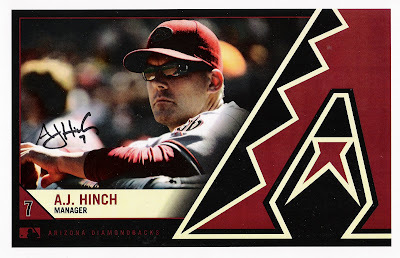 They started promptly at 6 pm and I was able to get cards signed by Hinch, Montero, and Kennedy. I got a ball signed by Reynolds on the sweet spot (I'm still trying to get a good picture of the ball). I got through the line, left the room and noticed that the line wasn't very long, so I got back in line and went through again and got a photo of each player signed. I was at my car by 6:20 pm. I had a great time! 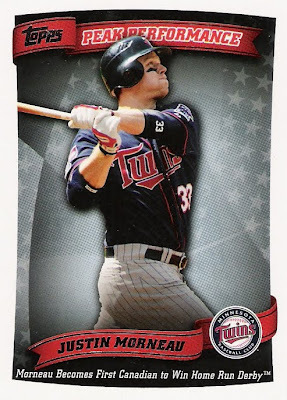 One of my 2010 Card Collecting Goals is to collect 50 cards of players holding multiple bats. I just think that they look cool and have always wanted to collect cards with a theme, I could just never decide on a theme. 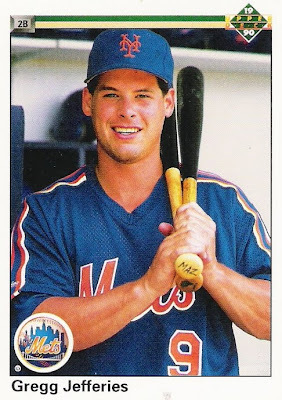 As I continue to go through my collection I look for cards that I can add to my Multiple Bat Collection. Surprizingly, they are not all that common. I did however find 4 cards recently that qualify. I now have 25 out of the 50 cards I need to reach my goal. 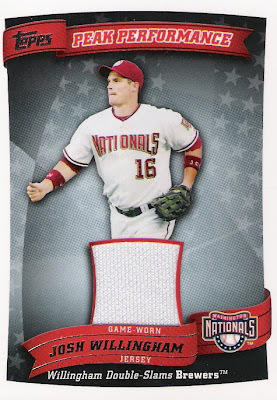 The other day I purchased a Jumbo pack of 2010 Topps and a pack of 2010 Upper Deck from Wal-Mart. 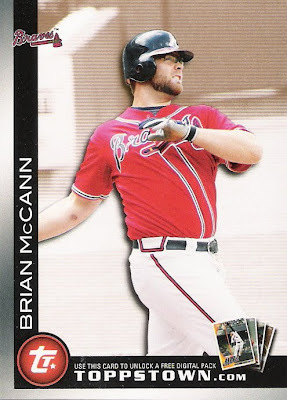 It was my first 2010 Upper Deck pack and I wasn't impressed. 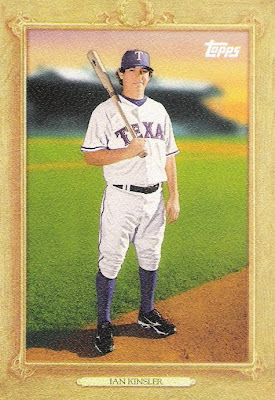 I realize that they don't have much to work with, but I was much happier with the 2010 Topps Jumbo pack. 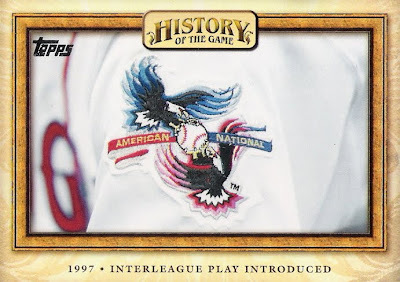 Lots of inserts in the Jumbo packs. I got 8 . Here are some of the highlights of the jumbo pack. 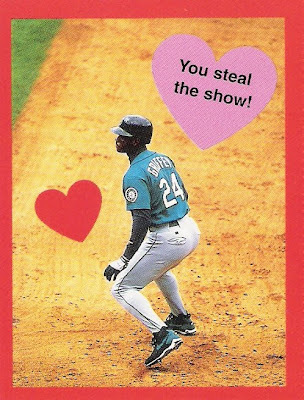 I can't believe what Topps did!!! And now you know, the rest of the package. 11 down, only 13 to go!